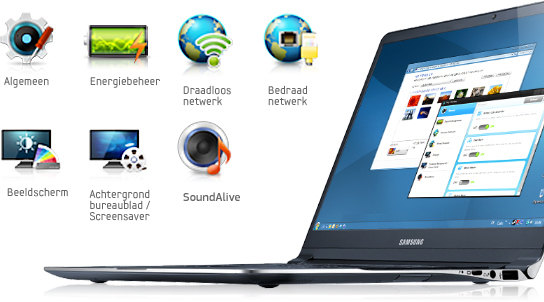 Samsung Series 9 made its first debut in the market with the Samsung Series 9 NP900X3C-A01 laptop, a.k.a ultra- book. This is one of the thinnest and lightest laptops with 13-inch screen and looks more or less like the Window version of Apple’s MacBook Air. The Samsung Series 9 NP900X3C-A01 is lighter, affordable and slimmer than its predecessor from the last year. The all-new Samsung Series 9 NP900X3C-A01 is lighter, leaner and less flexible physically than what we saw last year in its predecessor. The smooth hinge and extremely sleek form makes it absolutely smaller for 13-inch than other kinds of laptops of same dimension in the market. Guess about the weight? The new Samsung Series 9 NP900X3C-A01 weighs just 2.6 pounds, which is again lesser than any of league partners. The new Samsung series is formed of solid aluminum which provides it rock-solid appearance akin to the Apple’s laptops. The profile looks think like a blade with steel-metallic edges that hold the sides in its arms. Outer surface appears to be dark steel-blue and matte. So you see, the fingerprints are likely to appear every now and then! The keyboard is shallow and appears to be like MacBook and also Sony Vaio T. how is the experience of typing? Well it falls between MacBook Air and Sony Vaio T. We would say, it is better than Vaio and not very good as Air. It is backlit, but it is so faint that you might not notice it even! Samsung Series 9 NP900X3C-A01 boasts a beautiful as well as bright colored display of 13.3 inch matter. The text just pops up and looks absolutely crisp. Viewing anything at different angles is also a wonderful thing in Samsung Series 9 NP900X3C-A01. Even if it is at a maximum tilt, you can still read the text! The screen resolution is 1600×900 which is definitely great for a screen size like this! You will see the speakers at the front periphery of Samsung Series 9 NP900X3C-A01. They do offer crisp music and movie definition, but are not as loud as they should be. We would suggest, headphones are better than otherwise. Samsung Series 9 NP900X3C-A01 comes equipped with 1280×1024-pixel maximum resolution and also offers pretty good light sensitivity. The YouCam 3 software also comes preinstalled in the webcam. It should not surprise you to see that that there are fewer ports in Samsung Series 9 NP900X3C-A01. After all, it is an ultra-book that small! You do get the SD card slot, micro-HDMI as well as port for the VGA adapter. Overall, Samsung Series 9 NP900X3C-A01 is pretty cool, sleek, small and beautiful ultra-book that comes with a lot of features. Overall it performs well and we are quite satisfied with its overall performance and features. It is quite an impressive piece of laptop from Samsung, with only negligible flaws that should not bother the user until and unless you specifically require something!